And You Thought There Is Never a Girl Online? 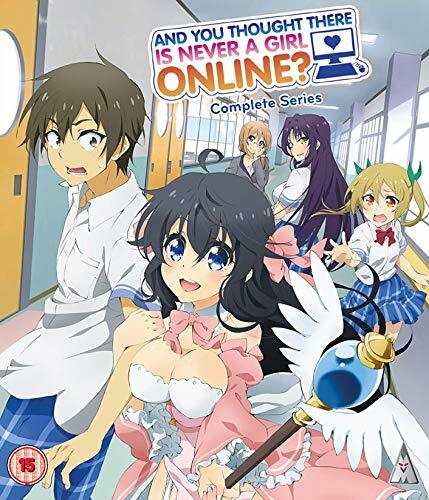 is an anime adaption of a comedy romance light novel series, which asks the question: ‘Are there really any girls online’? Today I’m here to take a look at this wacky and surprisingly insightful series! 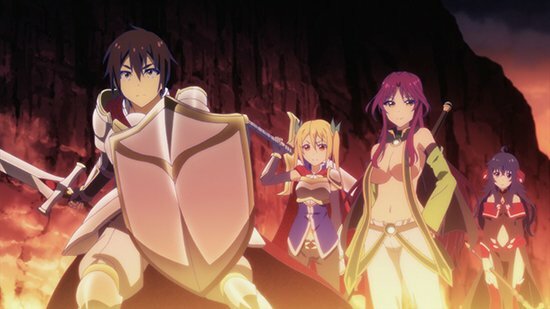 The story begins two years in the past when protagonist Hideki Nishimura confesses his love to a supposedly female friend in the MMO game Legendary Age. Nishimura is unfortunately turned down, and his friend reveals that they’re actually a guy! From then on Nishimura vows to never again trust that anyone’s who they say they are online and strongly believes there are no girls online. However, two years later – when the small guild he’s now part of decides to hold an offline meet-up – he’s in for the shock of a lifetime. Within his current guild, Alley Cats, Nishimura has an in-game wife called Ako Tamaki, who swears she’s a girl offline but Nishimura doesn’t believe her after his past experiences. However, when Nishimura discovers that Ako actually is a girl, he finds that his two other guildmates, Akane Segawa and Kyo Goshoin, are as well! Not only that, it turns out that all three of his guild friends also attend the same high-school as him. Nishimura is surprised by this discovery but is also largely indifferent to it. The only problem is that Ako’s just as clingy with him in real life as she is online – and even sees herself as his wife in reality! He’s in for a tough time convincing her otherwise, but perhaps, together with the Alley Cats, Nishimura can teach Ako that not everything in the game world is as it seems in reality. I’m sure many of you have heard the saying that there are no girls on the internet. This is a sentiment especially shared in the gaming world and, as a female gamer myself, I really like that And You Thought There Is Never a Girl Online? sets out to address it. Without being overbearing or throwing it in your face, the series deals with the question by featuring a collection of likable female characters. The fact that they’re all girls is never treated as something strange or problematic. The other thing I really like about And You Thought There Is Never a Girl Online? is how well it handles internet safety. Ako doesn’t understand that there are considerable differences between the internet and reality, which leads to situations where she’s too trusting of strangers (or lesser issues like considering herself married to Nishimura). Obviously this isn’t a good thing, so the work the Alley Cats put into teaching Ako internet safety is of great importance – both for her and us as viewers. It can remind people like me to always be safe online while also serving to impart some life lessons upon the younger viewers among us. Having said all that, And You Thought There Is Never a Girl Online? doesn’t take itself too seriously much of the time. It’s a comedy at heart, and it’s fun to sit back and watch the latest antics of this crazy cast. 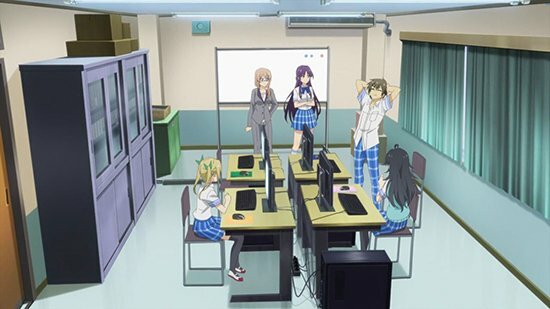 Their guild leader, Kyo, sets up a club at school so the four can get together and play Legendary Age after school. This gives us the perfect opportunity to watch Nishimura and co. interact both in the game world (where we experience the action through the eyes of their characters) and in reality (where Nishimura is getting angry because the girls gossip and forget to help him defeat their enemies). While none of the characters have notable depth to their personalities, they’re still a lot of fun to watch in action and Akane’s character has an interesting plot line throughout the series. Akane is a ‘normie’ at school, who doesn’t want her secret love for Legendary Age to get out and potentially ruin her reputation. This is naturally a huge problem when Ako goes around school talking to and referring to Akane by her in-game character’s name! This begs the question of whether people knowing about Akane’s hobbies is truly a bad thing that she should be shunned for. It’s a great character arc and, like with Ako, serves to educate the viewer on games as a hobby and that they’re not something to be ashamed of. 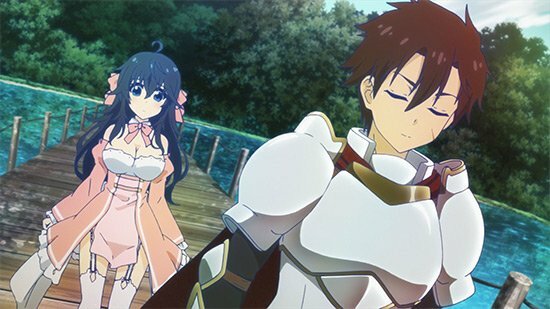 Animation for the series has been handled by studio Project No.9 (The Ryuo’s World is Never Done!, Girls Beyond the Wasteland). 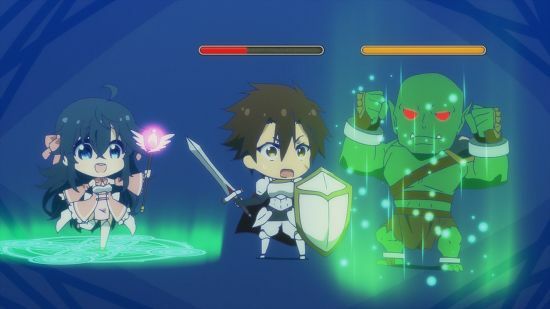 While some episodes appear quite low budget, usually when they’re largely set in the real world, the in-game world of Legendary Age is very bright and colourful. When not in the game the characters aren’t very attractively drawn (with notably pointy chins) and have fairly bland designs, which is a shame, but I think this somewhat works for the tone the anime is going for. It’s not trying to be overly fancy and instead aims to be a bit more rooted in reality. Where music is concerned the soundtrack has been handled by Maiko Iuchi (A Certain Magical Index, Heavy Object) and is a pleasant listen. My only real complaint is that there’s one particular track that’s reused a lot in idle scenes and watching more than a couple of episodes back-to-back makes it stand out in a bad way. It’s a shame because overall the music fits the series very well, but that one track overshadows the other tunes to be the only one I can really remember now. The voice actors for And You Thought There Is Never a Girl Online? sadly offer fairly unremarkable performances all told. Although there is nothing wrong with any of the Japanese or English cast, they all fail to leave a lasting impression. The dub cast also has the added issue where none of the voices sound young enough to fit the high-school age characters, but if you can get over that then the dub is by no means a bad option. This release is brought to the UK by MVM Entertainment and is available on both Blu-ray and DVD as a standard edition. Both sets include all 12 episodes of the show with both Japanese and English audio, along with trailers and clean opening and ending videos. Overall And You Thought There Is Never a Girl Online? is a show that sets out with silly comedy in mind but has the depth to both educate viewers and provide an enjoyable ride at the same time. Both fans of fantasy and slice of life series will get a lot out of the show and I for one really enjoyed my time with it.